At Sunshine Ice Blocks we are passionate about eating well, and we believe you can have a great tasting treat that’s good for you too. We take fresh, seasonal produce straight from the farmer, create delicious flavour combinations, freeze and serve. 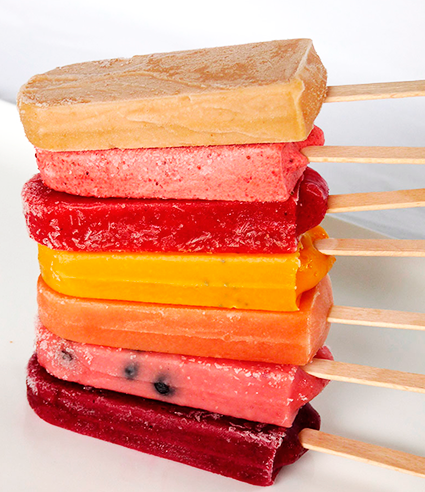 Pretty simple really – just a whole lot of delicious icy goodness on a stick. Sunshine Ice Blocks began with a desire to provide a delicious frozen treat for our children that we couldn’t find on the supermarket shelves. When you use beautiful, whole ingredients there is no need to add any artificial colours, flavours, preservatives or additives – so we don’t. We use the whole fruit (not just the juice) and we place a priority on using organic or pesticide free produce. Everything is gluten free, with little to no added sugar, and we offer a variety of vegan options. We’ve been hand crafting our all natural ice blocks since 2012 on our farm in Bull Creek on the Fleurieu Peninsula, South Australia. Our commitment to supporting local growers means you’ll only find the best produce from our region in our ice blocks. The amazing variety at our fingertips enables us to offer delicious and exciting flavour combinations as the seasons change. Our ice blocks contain only the good stuff, so you can be confident you’re providing a nutritious treat for you and your family.